The wars conducted by Charles the Bold were a disaster for the Burgundian Army On numerous occasions it was defeated by more mobile and aggressive Swiss forces, and at Nancy in 1477 Charles was killed trying to rally his forces against the enemy. In the wake of the Hundred Years War, one of Europe’s best armies was to be found in the service of Charles of Burgundy. Containing many mercenary veterans, the force was highly trained and had good equipment. It met its match on the battlefield, however, in the form of the Swiss infantry, whose speed and power canceled out the Burgundian Army’s advantage of being an all-arms force. Although the English had been ejected from France at the close of the Hundred Years War, some nobles continued to reject the authority of the monarch and mercenary bands roamed the country. The French king restored order by forming compagnies d’ordonnance, which, commanded by loyal and reliable officers, would form the basis of a standing army in France. In 1461 Charles VII died. His son, Louis XI, shared this desire to limit the nobles’ power. Chief among the king’s opponents was Charles the Bold (or Rash), Duke of Burgundy, who sought to establish a kingdom equal to that of France. He built up a professional army, many of them veterans of the Hundred Years War, including a proportion recruited from his former English ally. By the early 1470s Burgundy had 8,000 troops. Armored horsemen and mounted bowmen accounted for half; the rest were infantry – a combination of archers, handgunners, and pikemen. Charles divided his troops into self-contained companies, consisting of the various types of cavalry and infantry, who trained closely together to ensure cooperation on the battlefield. The army of Burgundy was widely feared. In 1474, for example, Charles intervened in a dispute over the control of the German city of Neuss, whose inhabitants had rebelled against the archbishop of Cologne. Charles supported the archbishop and marched an army to Neuss and laid siege. Charles’s artillery pounded the walls, but his troops could not break into the city. The next year the German emperor, Frederick II, stepped into the quarrel and led an army to the city’s rescue. Charles turned his army on Frederick’s forces and opened fire with his artillery. Frederick withdrew and opened peace talks. Charles agreed to end the siege of Neuss in return for Frederick’s help in the future. Charles’s interventions outside Burgundy alarmed the south German cities and the Austrian Hapsburgs, who allied themselves with the Swiss, whose infantry were the foremost soldiery of the day. Armed with pikes, halberds, and crossbows, they had asserted Swiss autonomy from the Austrian Hapsburgs during the 14th century, notably at the Battle of Sempach in 1386. The Swiss carried a reputation as ferocious foes. In 1444 a French army slaughtered a small Swiss force of 1,500 men; but while being annihilated themselves the Swiss killed double that number of French. So, in November 1474, it came as no surprise when the Swiss repulsed a Burgundian incursion and advanced into Burgundian border lands. Charles responded in February in 1476, marching with an army of 15,000 men into the Swiss town of Granson and hanging all the Swiss troops he could find. By March 2, a Swiss force had arrived seeking revenge. Charles had archers, heavy cavalry, handgunners, and artillery, and he formed up outside Grandson, with Fake Neuchatel on his right. The Swiss infantry force of 18,000 men was divided into three tightly-packed columns equipped with pikes. The speed of the Swiss advance caught the Burgundians by surprise, the complex enveloping action ordered by Charles became disorganized, and his center fell back in disarray. Charles’s army then started to retreat, but the Swiss marched on and cut down his men wherever they caught up with them. About 1,000 Burgundian troops were killed at Grandson, along with 200 Swiss. Charles refused to be deflected from his ambition to drive the Swiss from his lands, however. In June 1476 he laid siege to the fortified position of Morat with an army of 20,000 men. Expecting the Swiss to send an army to its rescue, Charles had his men dig field fortifications, and he then placed his archers and artillery behind them and waited for the enemy. The Swiss army of 25,000 reached Morat on June 22. Due to bad weather and inadequate sentries, the Burgundians were unaware of the Swiss advance and the Swiss came upon the Burgundian lines while most of Charles’s army was resting. The pikemen and halberdiers ploughed through the half-empty defenses, slaughtering all in their way. 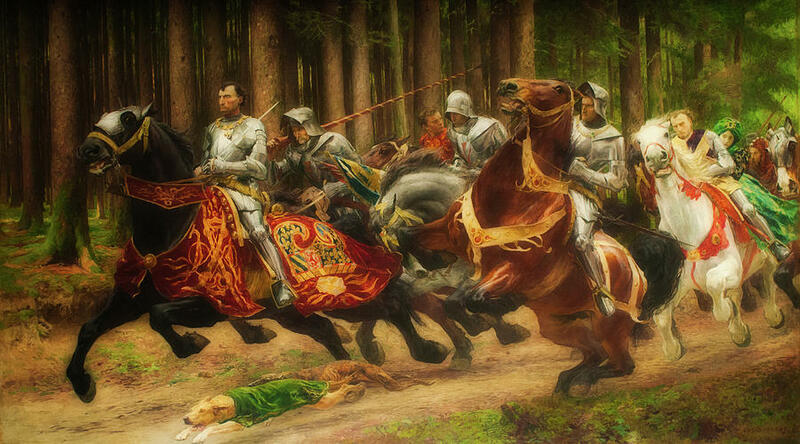 A substantial Burgundian force of 7,000 men were trapped and killed to a man. The Swiss and their allies then took the offensive, entering Burgundian territory. Charles reorganized his forces and, on January 5,1477, he met the Swiss outside Nancy. The Burgundians were caught between two Swiss forces and thrown back. 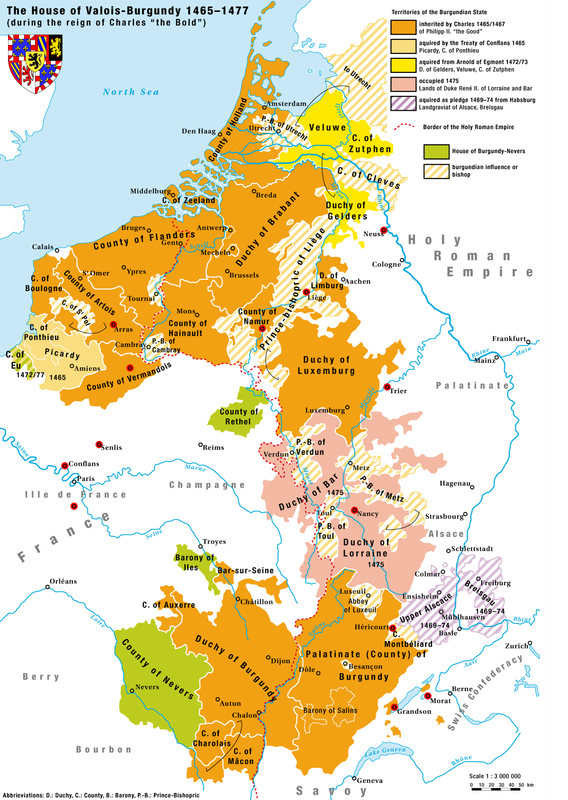 Charles was killed as he tried to rally his troops, and his defeat and death put an end to any pretensions that Burgundy might develop into an state independent from France. Louis XI adroitly took most of the duke’s lands for France. Charles had possessed one of the most modern armies of the day, well trained and with good equipment, but he had not used it effectively on the battlefield. He had underestimated the speed and power of the Swiss infantry, who canceled out the Burgundian Army’s advantage of being an all-arms force. The war with Burgundy established the Swiss as the most fearsome soldiers in Europe. Machiavelli wrote of them: “No troops were ever more expeditious on the march or in forming themselves for battle, because they were not overloaded with armor.” Their mobility allowed them to outmaneuver their opponents and force battle on them when they were unprepared. Some pikemen wore limited armor – steel cap and breastplate – but many preferred to fight with a leather jerkin or buff coat. The Swiss fought in deep columns with long pikes and halberds, a bristling hedgehog similar to the phalanx of classical times. The halberd was not as long as the pike, but had a heavy steel head tapering to a point, to which was attached an axe blade and a secondary spike or hook used to catch the reins and pull down charging horses. At Nancy, it was a halberd that brought down Charles the Bold with a single blow that split his skull open. The pikemen and halberdiers were preceded into battle by light infantry who carried crossbows (and subsequently handguns), their role being to unsettle the enemy and draw fire away from the pike columns. Despite the success of the Swiss in defending their homeland, they did not represent the future of warfare. They were conservative in their military thinking and did not absorb the changes that were taking place as the 16th century dawned. Above all, they failed to take into account the new role of firearms, especially artillery, although their reputation ensured that they would have a career as effective mercenaries. The future of military operations fell to those armies that had the support of an economically powerful state prepared to harness the resources of the nation. To be successful in warfare, an army had to combine the latest gunpowder technology with large and disciplined bodies of infantry and cavalry. Of these, the armies of the Ottoman Empire, France, and Spain would be in the forefront. This entry was posted in Armies, History by MSW. Bookmark the permalink.